In the beginning of this guide, we defined what a lead is. As a quick refresher, a lead is not yet a customer, but they’re on their way to becoming one. You just have to nurture and convert them. We also mentioned MQLs or marketing qualified leads. These leads have already shown interest in your products/services. Perhaps they’ve done successful business with companies like yours in the past. That means they’ll likely be more receptive to your offerings. Prospects are in a similar vein to MQLs. They too may be readier to make a purchase. Instead of requiring a little push to reach the threshold, they tend to know what they want. If you’d like a clearer comparison of leads and prospects, then this is the chapter for you. In it, we’ll not only lay out a clear definition of prospects, but we’ll explain the difference between them and leads. We’ll also delve into how to get curious and reluctant leads to become qualified prospects. What’s the Difference Between a Lead and a Prospect? You should recall what a lead is from Chapter 1 of this guide. Leads have found your products/services, most likely through your marketing efforts. They don’t know anything about your company yet, so they’ll spend some time learning more about you before doing anything else. When they’re ready, they’ll likely opt into your email newsletter. They may also take advantage of your lead magnets or other targeted offers, although rarely will they make a purchase early on. After all, this stage is all introductory and research-based for them. They may never engage with your company again after opting in, even if they download a free offer of yours. By nurturing the lead via email and content marketing, you can hopefully convince them to make their first purchase and thus become a customer. This is, admittedly, a crapshoot. It may work out, or the lead might decline doing business with you for any number of reasons. That’s why some companies devote part of their efforts into developing sales-ready leads. These leads go through a more specific filtering process so you know they’re the right people to become your customers. Sales-ready leads are open to your contact and may be easier to convert. There’s less risk of losing them than regular leads, which can disappear at almost any time. Given that you know so little about your leads at this early phase, they can vanish for nearly any reason, too. What about prospects? Prospects are more like MQLs, which we touched on in the intro. Think of the word “prospective.” What does it mean? It refers to a higher likelihood of something happening. A prospect then is someone who has a higher likelihood of becoming a customer. Unlike leads, who don’t know much about your company at the beginning, prospects do. They’re very interested in what you’re selling, too. They’re also much readier to buy compared to your average lead. While they require less nurturing than leads who are just entering your funnel, they do need to be engaged with to progress the professional relationship. Here’s a great illustration from B2B lead generation company HIPB2B that showcases the difference between leads and prospects. 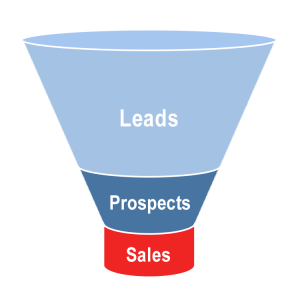 As you can see, in the sales funnel, your average lead lingers around the top. They may get to the middle of the funnel, but by this point, they’ve probably gone through some filtering process. They may be qualified or not. At this stage, you’re doing most of the reaching out, and it’s not uncommon for you to not get a response. Compare that to qualified leads or prospects. They enter the sales funnel towards the middle or even nearer the end. They’re intrigued by your company and prepared to make a purchase. If you communicate with them, you’ll typically hear back from them. That necessitates more personalized email exchanges. If you can, you always want to attract prospects to your business since they’re more qualified. That doesn’t mean you should discount the leads that come in, since some will convert. Just remember that it won’t be all. You might have a sales team or other branch that oversees sales-ready leads while another part of your company takes care of prospects. This way, you’re not missing any chance to make new customers. What Is a Lead-Qualified Prospect? The lead gen tactics that work for your company now may not always. That’s due to the changing landscape of marketing and technology. According to Neil Patel, today, email marketing is the top online lead gen tactic. It wasn’t always this way. Before the Internet became so prevalent, marketers had to use other means of engaging with their audiences. In the next few years, something else entirely could change the way marketers convert leads into customers. What Is the Importance of Lead Generation? In some instances, you might find those who are even more willing to engage with your company than even a prospect is. These gems are known as lead-qualified prospects or qualified prospects for short. These qualified prospects have characteristics that set them apart from your average prospect. The first of these characteristics is their interest in what your company has to say. Whether it’s a sales representative or another valuable staff member, when they talk, this qualified prospect listens. Another characteristic is that these prospects are generally trusting in your company and its employees. This goodwill can then be built upon as you nurture the professional relationship and eventually convert the prospect into a customer. Lead-qualified prospects tend to exhibit some urgency as well. They’re interested in buying from you sooner than later. They’re confident in their timeline and don’t plan on deviating from it. This makes it much easier to close the deal and convert the prospect. They’re also quite confident in their commitment to make a purchase. There’s no wavering here. This lead has done their homework, extensively researching the pricing page for your products/services. They know what they need and how much they’ll pay for it. They’re ready to checkout. If you can identify which stages of the sales funnel the qualified prospect is in and guide them towards the end of the funnel, that leaves you with a lead prospect opportunity. This opportunity refers to closing the deal and making a great customer. You know by reading this chapter that having qualified leads is better than regular leads, and qualified prospects are best. How exactly do you go from lead to prospect? After all, prospects have a higher chance of converting, so it’s a safer bet to first convert leads to prospects and then to customers. To achieve your conversion goals, you should make your own prospecting plan. Plans will undoubtedly vary from company to company depending on your business needs and goals for the future. In the plan, you’ll want to make several determinations. First, you have to be honest with yourself. Out of your current pool of leads, which ones are most likely to be prospects? If the answer is fewer than you want, it’s important to keep attracting new leads. You might also begin filtering them by specific criteria to ensure they’re as qualified as you’d prefer. You next have to count the number of customer accounts you can start. Depending on the budget your company has, this may be a lot or just a few. From there, predict what your average sales volume will be after opening these accounts. Finally, create the part of the plan where you decide your means of following up with your qualified prospects. Will it be by phone? Email? Maybe even both. Now you can implement your prospecting plan. As you do, create a list of all your leads and decide which ones are most qualified. These are the ones you want to target as part of your prospecting plan. You must provide incentives, offers, and other deals that make the prospect want to become a customer. These offers should be targeted to their interests, pain points, or other relevant data. You won’t always be successful in your efforts to convert prospects to customers, just like you might fail to convert some leads to prospects. No company hits it out of the park every single time, and that’s okay. By following the advice we presented in the first two chapters of this guide, you’ll have a few good ideas for generating new leads. With a continuous influx of leads, your company can recover if even some qualified leads ultimately don’t become customers. Leads are potential customers, but there are some leads that are more interested in doing business with you from the get-go. These are known as prospects. Their high level of qualification makes them desirable to all sorts of companies. After all, when it comes to boosting ROI and conversions, wouldn’t you prefer that to be a surefire thing than something that may or may not happen? Prospects are sometimes classed into lead-qualified prospects. These are your most receptive prospects by far. They’ve been open to communication, responded when necessary, done their research, and are ready to make their purchase. If you want to reach potential prospects and drive leads, following the tips recommended in this chapter should help you achieve those goals. Having a prospecting plan is also key. We know you may have more questions still about lead generation. That’s why, in Chapter 4 of this guide, we’ll tell you how to master the concept. When you’re done with this guide, you may finally be able to reach those elusive highly-qualified prospects that have dodged you until now.